The paradox of choice bedevils those confronted by variety. Exponents of world cuisine buffets know this. It was a similar situation for 4E D&D players, a profusion of classes and builds for each class made for tricky choices modified by races, hybrid characters and more. Add options in additional core books, core classes in non-core books (Et tu, Swordmage?) and a steady stream of errata. Then add D&D Insider with exclusive tools and character classes including the Assassin. The overhead for the game is significant despite potential re-use and proved intimidating to new players. So this year Wizards released D&D Essentials Red Box as a gateway to the hobby. This is a good thing. Other Essential boxes are forthcoming (Heroes of the Fallen Lands, Heroes of the Forgotten Kingdoms, DM's Toolkit and Monster Vault) to expand the horizons of new players. Maybe less endearing for those who've already invested in 4E are scheduled Essentials products. Bill Slaviscek explains in a recent Ampersand column. We're not talking about anything earth-shattering; rather, numbers have been tweaked here and there to make creatures more challenging, or powers have been given more interesting and dynamic effects. Of course this tweaking extends to player characters - the slayer and knight are versions of the great weapon and guardian fighter. The new build for the druid goes further, losing the wild shape class feature. 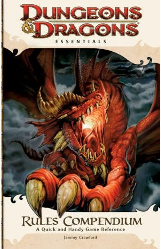 While Core Rules and Essentials are compatible, it's clear Essentials is the future for D&D which may annoy those who invested in the last bookshelf. Future releases include in February 2011, the Class Compendium: Heroes of Sword and Spell which converts five classes in the 4E Player's Handbook (cleric, fighter, rogue, warlord and wizard) into Essentials format. March 2011's Players' Options: Heroes of Shadow brings the once-exclusive assassin, the necromancer and the hexblade to the table. Other Essential softbacks with the remaining classes will probably follow - Class Compendium: Heroes of Legend appeas a likely candidate. As for that simplified game promised by the new Red Box? Enjoy while it lasts. There's a whole new bookshelf on the way! Reading your rundown and litany of 4e classes (with words like "exclusive") it makes me think they've almost taken a "collectible" approach to 4e. I don't mean that derogatorially (though I admit, I wouldn't like it erre I playing 4e) but as an observation. Closer to a two-tier model. DDI subscription implies a premium service with tools that make it easier to play and exclusive benefits - if you don't mind exclusive benefits being published to the peons a year or two later. That said, the DDI tools haven't been updated in a bit - maybe a new iteration in line with Essentials is being planned. I understand event cards are being planned so the collectible model may apply at some point. I'm curious what other 4E players think - I've heard a lot of corporate shilling and not much dissenting opinion from players beyond a vague unease their books will become obsolete before the end of next year.